In February I posted about an artcle in AOPA Flight Training Magazine in which several aviation blogs were showcased. That article came on the heels of an article that promoted MyFlightBlog.com and several other aviation blogs in the Wall Street Journal. 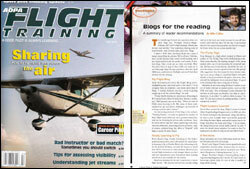 I was pleasantly surprised to learn that when Mike Collins wrote a follow-up article on blogs for the April issue of Flight Training Magazine. In "Blogs for Reading: A Summary of Reader Recommendations" Mike featured seven aviation blogs including MyFlightBlog.com. For those that don't have a subscription to the magazine I scanned a copy of the article that you can read here. This website was in great company with several other blogs that I read on a frequent basis. Mike Collins wrote "We've all seen 'information' on the Internet that wasn't worth reading, but I was impressed by both the quality and variety of aviation blogs." When I started this blog in the Spring of 2004 there were only a handful of other aviation blogs. One of which was David West's Flight Lessons Learned which was also mention in this article. It is great to see that several years later there are an abundance of blogs to help educate and inspire aspiring pilots. Also featured in the article was fellow Illinois based student pilot Evan Krueger of The Flying Toga. I was glad he was featured as I had not stumbled upon his blog yet. I have really enjoyed following Evan's experiences learning to fly. He is learning to fly out of Lake in The Hills airport a small airport Northwest of Chicago. Also mentioned were Finally Learning to Fly, Signal Charlie and Roger's Soaring Blog. Thanks so much for putting in a little section about my blog. I really appreciate it. I promise to return the favor as well as add you to my blogroll. I very much enjoy reading your blog. The information and layout is excellent. Thanks again! I just wanted to say I really enjoy your page and say congrads on AOPA mention. I just started my site and when I get around to adding a link page will be recommending and posting a link to your site. I hope to entertain, and help a pilot or two along my way. Keep up the good work. Great blog here. Congrats on being featured by the AOPA as well. Great blog.BTW - have you heard of the Asian Academy of Aeronautics?